Cervical squamous dysplasia is seen at medium magnification, extending from the center to the right. The epithelium is normal at the left. Note how the dysplastic cell nuclei at the right are larger and darker, and the dysplastic cells have a disorderly arrangement. 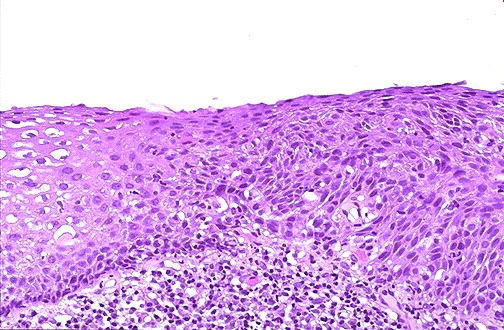 This dysplastic process involves the full thickness of the epithelium, but the basal lamina is intact, so this is a high grade squamous intraepithelial lesion (HSIL) that can also be termed cervical intraepithelial neoplasia (CIN) III. A HSIL can be focal and completely excised.